What a novel idea, take a chemical substance (water) that is found naturally around the world, filter it, bottle it up and make millions. Sounds simple, right? Well not really, in fact these days it is near impossible to break away from the competition and really make it in the merciless consumer products business. 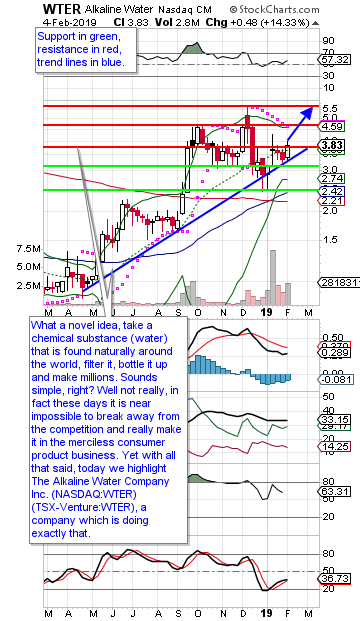 Yet with all that said, today we highlight The Alkaline Water Company Inc. (NASDAQ:WTER) (TSX-Venture:WTER), a company which is doing exactly that. We’ve been monitoring WTER for years, so have seen the Company’s growth first hand. While this feature is a technical exercise, we encourage investors to check out WTER from a fundamental perspective. A quick look will show record sales, a recent up list to the Nasdaq and ongoing partnerships to ensure continued revenue growth as just some of the recent impressive accomplishments for this still relatively new comer to the consumer products sector. When we review the stock from a technical perspective, we notice a stock in a beautiful uptrend since late-April. As annotated on our U.S. listed stock chart, this up trend was tested a few times, and in each instance the bulls came in with force and pushed shares higher. If there was ever a time to jump into a high flyer like WTER, the recent pullback from mid-December to mid-January was definitely an opportunity with shares dropping 56% from top to bottom during that time. In fact, since the bottom was hit in mid-January, shares are already up an impressive 56%. Even though the run has been spectacular, shares are still 31% lower than their mid-December highs. With the upward trend line still in tact, the company firing on all cylinders fundamentally, there is no reason to believe that those mid-December highs cannot be re-tested, and quite likely broken in the short-term. Looking at specific levels of resistance, the stock looks to currently be at a key level ($3.80 - $3.85). We think this is the last major level that the bulls should concern themselves with. If we get a breakout of this level, the momentum alone could result in a re-test of those December highs. But before they can get there, there also appears to be resistance around $4.60. For this trade, we would be looking to place a price target right underneath those December highs, specifically at $5.55. As for support, we would watch the $3.40 level as it is where the upward trend line is currently and rising. Below that, support would likely enter the picture at $3.15 and $2.45. While we believe the key level to watch is the upward trend line to hold, we would opt for a stop loss at $3.14, or just a whisker underneath the $3.15 static support level. Today was a strong day with volume surging and the stock up 14.3%. While it looks like a breakout, we do want to see one more day of trading to see if this stock can muster some continued momentum. The reason for our reluctance to jump in at the open is because the stock is pressed against a key resistance level ($3.80 - $3.85). As such, if the stock closes higher in tomorrow’s trade, we would enter Wednesday at the open. If, however, shares close lower in tomorrow’s trade, we would only enter upon a close above $3.84, specifically on continued strong volume. Based on a $3.84 entry level, our upside potential looks to be 44.5% while our downside risk is limited to 18.2%.